Hosts: John Breslin, Marie Boran, Fergal Gallagher and Tom Murphy. Doug Engelbart obituary, 3D printing, Bitcoin and the Winklevii, Bebo buyback, interview with Padraic Harley from 091 Labs, national broadband plan for Ireland, Philips Hue, Nokia Lumia 1020, Webseam, and more. Download or subscribe to this show at technologyvoice.com/show. For additional show notes, visit the full page for this episode. Technology Voice is brought to you by StreamGlider, the real-time streaming newsreader for iPad. And by Seevl, a music discovery service for YouTube and Deezer. Some photos I took in 2009 at Java’s and their window display about a famous former waiter. A favourite café of mine and many others in Galway City is Java’s on Abbeygate Street. In the late nineties, after a late night of playing computer games with friends, I’d sometimes wander in to Java’s for a hot chocolate before heading home. A few years ago, in 2009, I read about one of the waiters who worked there around that time. Turns out, I had unknowingly been watching this same guy on TV: he played the Sylar character in Heroes and had been cast as Spock in the new Star Trek reboot. I had a flashback: ahhh, that American waiter, yes, now I remember him from when he was in Java’s – so it was Zachary Quinto who kept losing my orders! 15 years later, Zachary was back in Galway to speak at the 25th Annual Galway Film Fleadh, where he took part in a Q&A session, discussing amongst other things his acting career, why he came to Galway originally, and how he uses social media. He was also on hand for showings of two films he co-produced: Margin Call and All is Lost. 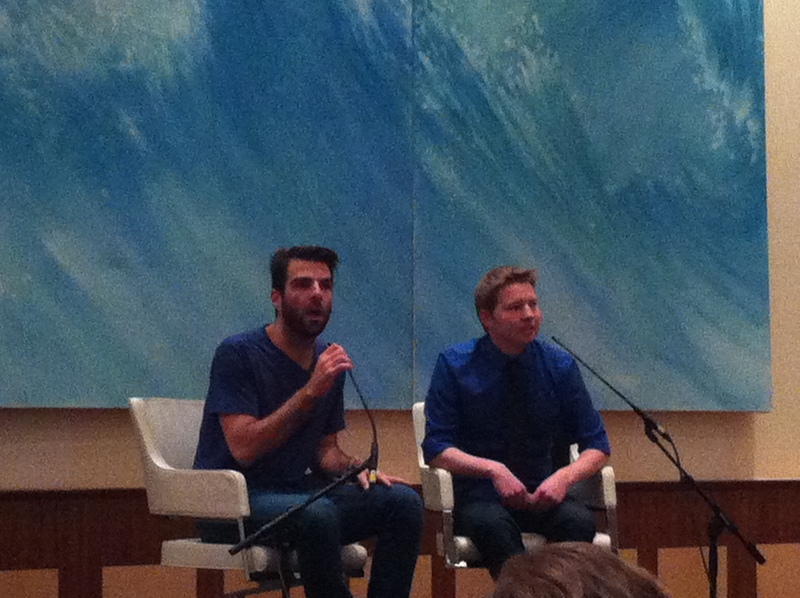 Zachary Quinto in the Q&A session with Will Fitzgerald at the Galway Film Fleadh. When he arrived in Galway last Thursday, one of the first things that Zachary did was to go to his old place of work for a coffee. You can watch an Instagram video of a walk he then took retracing the route from Corrib Park through NUI Galway back to Java’s (and here’s a map if you want to try it yourself). The video has already been viewed nearly 9,000 times. “Follow me up [on Instagram]!”, said Zachary. “I like it actually. You know I have a certain level of skepticism about social media, but I use it: a total necessary evil. With over 790,000 followers on Twitter (six times his Instagram following), that may sound like a lost marketing opportunity, or at least one for the future. Zachary Quinto Aftershave, anyone? Zachary has European heritage: he is half-Irish (through his mother’s side) and half-Italian (from his late father). He did some research before coming to Galway in 1998, and found out that it was one of the fastest growing cities in Europe. “It was at a time when I felt really there was a limitlessness of possibility, and that was incredible because it was the first time I travelled abroad by myself and decided to live in one place”, said Zachary. “I met great people and hung out with a handful of them last night which was great – we reconnected – thanks to social media actually. So that was kind of alright. He also recounted some funny stories about when he was working in Java’s and how he lost some orders taken on notepad paper. The scraps of paper were left on top of a toaster oven, and either caught fire or fell in behind the toaster where Zachary couldn’t get at them. Zachary also referred to a third Star Trek movie that may begin filming in 2014. He hinted that he would be interested in a cameo in the popular science geek sitcom, the Big Bang Theory, something that Leonard Nimoy has already done. Let’s hope he gets to play Rock-Paper-Scissors-Lizard-Spock on the show. 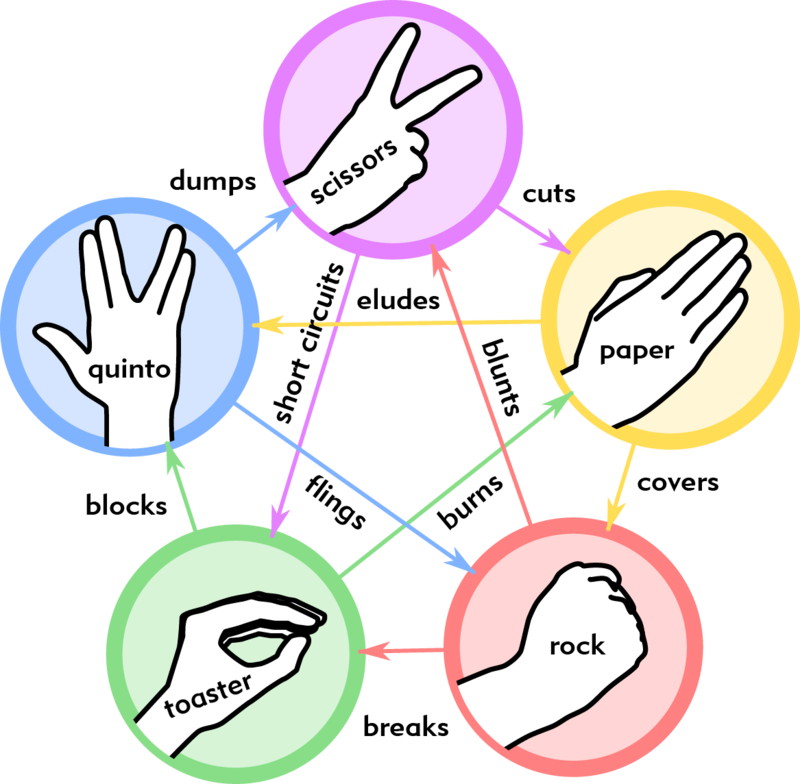 Or maybe Rock-Paper-Scissors-Toaster-Quinto. The rules for this new game are below, and we’d love to play it with Zachary next time he is in Galway! Toaster oven (yes, that’s a hand shaped like a flame!) burns scraps of paper with orders, toaster oven blocks Quinto from getting at scraps of paper, scraps of paper elude Quinto. As well as Zachary, Galway has some more connections to the world of science fiction and fantasy. Former NUI Galway student Martin Sheen has been in his fair share of science fiction. JRR Tolkien was once an external examiner at the University and a regular visitor to Galway. Planet of the Apes actor John Huston lived for many years in Galway, and the University’s Huston Film School enjoys patronage from the Huston family. Fictional character Angel from Buffy the Vampire Slayer was purportedly born in the Claddagh. Eye Cinema‘s design was inspired by Thunderbirds. Futuristic anime Fractale features backdrops from Galway. 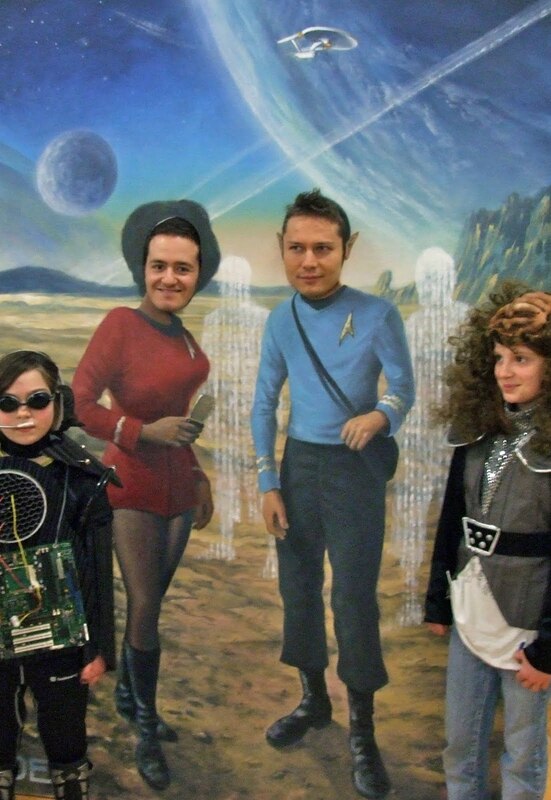 And the National Computer and Communications Museum uses Star Trek to illustrate future technologies to visiting school kids (plus they have a fun Uhura and Spock head cut-out board: now there’s a future photo op for you Zachary!). Know of any others? E-mail us at editor@technologyvoice.com. GigaOM is having its second annual Structure:Europe conference on the 18th and 19th of September in London. The conference features many C-level executives from top cloud computing companies, with a focus this year on federated cloud, data centres, mobile operators, privacy and trust, and open data. Some of the technologists and business leaders that will be speaking at Structure:Europe include: Brad Garlinghouse, CEO of YouSendIt; Ulf Ewaldsson, CTO of Ericsson; and Barak Regev, Head of EMEA Cloud Platform Products with Google. We are also happy to announce that we have a 25% discount on registration for Technology Voice readers. Over two days, Structure:Europe will feature some of Europe’s leading visionaries on cloud computing and infrastructure, and will examine the seemingly unstoppable march of cloud into the global business arena, as well as what’s next for the cloud in Europe. Led by the team behind GigaOM’s Structure and Structure:Data summits, the London event presents topics specifically affecting the EMEA region. The list of companies and organisations speaking at Structure:Europe is impressive: Libelium, Zimory, CERN, Fastly, Cloudscaling, NumberFour, OnApp, HGST/WD, Microsoft, Capgemini, ElasticHosts, Hewlett Packard, Metamarkets, Ericsson, Netflix, YouSendIt, ESA, CloudSigma, Flexiant, Pivotal/EMC, Strategic Blue, Acunu, Server Density, Dell, Google, ownCloud, UK Government’s ODI, LogMeIn, Switch, UpCloud, and Trader Media Group. What is even more remarkable is the positions of the speakers in their respective companies: CEOs, CTOs, founders and VPs. We’ve created a handy Twitter list of Structure:Europe 2013 speakers, so that you can follow the people involved in the run-up to, during, and after the Structure:Europe event. You can also keep track of the event using the #structureeurope hashtag. But Structure:Europe isn’t just for the large corporates and multinationals. Startup Zone will highlight some of the best and the brightest startups out there, and interested companies can apply to be one of 24 Startup Zone companies that will receive a free pass, table space in the expo hall, VIP networking and mentoring, and more (entries are open until the 19th of July). 10 of the 24 will then be selected by a panel for the Startup Launchpad, presenting on stage in front of some of the biggest names in cloud computing, data, and VC funding. Researchers and those developing future technologies will find topics of interest too. One emerging area is in the intersection between the Internet of Things and cloud infrastructures, with EU projects like OpenIOT led by Professor Manfred Hauswirth at DERI creating open source solutions for the Internet of Things and the cloud. We asked Alicia Asin, CEO and co-founder of Libelium, and one of the speakers at Structure:Europe, about how she sees the vast amounts of data coming from sensors and the Internet of Things affecting cloud computing / storage, and what role does Europe have to play. If you’re a player in the cloud computing and infrastructure space in Ireland or elsewhere in Europe, Structure:Europe should be an essential event on your calendar. Readers of Technology Voice can use this link to save 25% on registration – http://structureeurope2013.eventbrite.com/?discount=TECHVOICE – or just use promotional code “TECHVOICE” at registration. For further questions, please email the GigaOM team. Social media has become a vital tool for the contemporary journalist. From Syria and Turkey to Brazil, international news stories are broken by ordinary citizens on social media every day, and it’s not just serious news. The latest football transfer rumours or celebrity scandal is now more likely to break on Twitter than by conventional means. The emergence of these new technologies is fundamentally changing the way journalists work and source stories. Despite the proliferation of social media – particularly among journalists – until now no formal study on Irish media professionals’ use of social media has been carried out. Researchers at the Digital Enterprise Research Institute (DERI) at NUI Galway have launched the first national survey on how Irish journalists use social media. Similar studies have been carried out in the UK, Europe and worldwide, but this is the first comprehensive survey on Irish journalists’ use of social media. This new study aims to measure the function of social media for professional journalists in Ireland, and the frequency and prevalance of social media as a tool for journalists. The researchers are calling on all journalists working in print, TV, radio and online media to take 10 minutes out of their busy schedules to fill out the online survey. “The ubiquity of social media is quickly changing the global media landscape, leading us to query Ireland’s contemporary journalistic practices”, said Dr. Bahareh Heravi, the project manager and leader of the Digital Humanities and Journalism group at DERI. “This survey will help to not only delineate these practices, but the data collected has the potential to ultimately result in more informed and accurate reporting”, she added. The project is being run by the newly-formed Digital Humanities and Journalism group, which leads a number of projects exploring how new technologies are impacting the world of journalism and other digital humanities like archiving. The survey can be accessed at surveymonkey.com/s/IrishSocialJournalism and more information on the research group can be found at hujo.deri.ie.